In the prior post, I talked about asset-side shenanigans in pensions (specifically, public pensions and MEPs). So why do we spend so much time complaining about some side problem with one of the systems, instead of the major problem with all three [defined benefit pensions, defined contribution pensions, and Social Security]? Because none of the experts know how to get people to actually do this: to save 15 to 20 percent of their income, or sit still for a law that would make them. Nor has any clever technocrat come up with a way to sort of slip this by folks without their really noticing. The 401(k) was not the miracle cure for our retirement problems that was promised by some of its more zealous advocates. But it wasn’t a mistake, either, or at least not the important one. The important mistake was deciding that we could spend our first 25 years in school, and our last 25 years in retirement, without cutting our consumption in between. And, at least to date, that’s one mistake we don’t seem to be able to learn from. - the fact that the promises being made are super-expensive, and they’d like to see if they can pay for these promises cheaply… by hoping to hit it big at the casino. Note that hitting it big at the casino is not the safest strategy for a secure retirement as an individual. It gets no better when it’s a pension fund covering thousands of people. This is not a diversifiable risk, as we say in the biz. - very low retirement ages – in the U.S., most people are living into their 80s. Some public retirees have been able to take “normal” retirement before age 50. - questionable disability pension boosts… at even lower ages – some can retire even earlier than “normal” retirement age if they have a qualifying disability. Some of those disabilities are questionable, and some have been busted for fraud. One of Illinois’ new laws for the new year clarifies the definition of a public employee with regard to pensions. Illinois owes hundreds of billions of dollars for public pensions – for everyone from school teachers to local firefighters. But a new law that takes effect in the new year makes it clear that people who work for state associations aren’t eligible to receive pensions. The 2017 law states people who work at the Illinois Association of Park Districts or the Illinois Association for Supervision and Curriculum Development and at other such entities aren’t entitled to pensions for their time there. State Rep. Jeanne Ives, R-Wheaton, said taxpayers can accept paying for retirements for teachers or snow plow drivers. However, taxpayers shouldn’t be forced to pay for lobbyists’ pensions. Ives said lawmakers talked about closing the loophole for association pensions more than five years ago, in 2011, but it took six years to pass legislation. The outgoing head of the Port Authority is set to receive a retirement benefit reserved for just him and about 50 other execs at the scandal-scarred agency — a double-dip pension, The Post has learned. Executive Director Pat Foye and administrators of the PA’s PATH system were deemed eligible to collect pensions from both New York and the federal Railroad Retirement Board under a questionable “legal finding” by the authority’s lawyers, sources said. The PA wouldn’t reveal how many former executives are currently pocketing dual pensions or are in line to get them, or even say when the double-dipping began. But the situation is under investigation by both PA Inspector General Michael Nestor and state Comptroller Tom DiNapoli, who thinks it’s “troubling” and “possibly illegal,” sources said. In addition to Foye, those set to receive dual pensions include former Executive Director Tony Shorris, who is now the city’s first deputy mayor under Mayor de Blasio, sources said. Revelation of the double-dipping comes as a former PA official, Bill Baroni, awaits sentencing in the New Jersey Bridgegate scandal, and just weeks after The Post exposed PATH workers sleeping on the job while racking up overtime pay. Tim Hoefer of the Empire Center for Public Policy called the dual pensions a “major problem” that could wind up costing the bi-state PA millions. “You can’t imagine any scenario in which two pensions are being paid to the same individual for the same job that are being back-stopped by the public,” Hoefer said. Most “double-dipping” re: pensions talks about “retiring” and starting one’s pension… and then going back to work for the government, collecting a salary. This kind of double-dipping is new to me. A state appeals court has upheld a 2013 California law that eliminated a pension benefit for hundreds of thousands of state and local government employees in an effort to reduce the pension system’s mounting deficits. The lawmakers’ action in eliminating the right of public employees to buy additional retirement credits was “wholly reasonable” and did not violate any binding promises made to the employees, the First District Court of Appeal in San Francisco said Friday. A lawyer for a firefighters union that challenged the law said it would probably seek review by the state Supreme Court, which has already agreed to consider another case cutting back on public pensions. Of course, it may be reversed. John Keane resumed the never-ending battle Thursday over his pension by filing a lawsuit that contends the Police and Fire Pension Fund has no legal right to pay him a pension that is less than what the fund contractually agreed. Keane, who retired in 2015 as the fund’s longtime executive director, is demanding full restoration of those pension payments. The suit names the Police and Fire Pension Fund’s board of trustees as the sole defendant. [General Counsel] Gabriel’s opinion determined that because the City Council never voted on the Senior Staff Voluntary Retirement Plan the pension fund board set up in 2000, there was no legal basis to Keane getting a $235,508 a year pension. Based on Gabriel’s opinion, Mayor Lenny Curry ordered a stop to those payments. In its place, Curry said Keane would get pension payments as if he had been enrolled in the city’s General Employee Pension Plan, which reduced Keane’s payments to $188,578. But Keane’s suit argues the Police and Fire Pension Fund is “an independent agency from the city, created wholly by state law,” so the General Counsel’s Office has no ability to issue binding legal opinions on the fund’s actions. I don’t know, I’m not a pension lawyer. I guess you had to pass it to see what kind of pension benefits you’d be getting. Since the financial crisis, 74 percent of state plans and 57 percent of large local plans have cut benefits or raised employee contributions to curb rising costs. Plans with a larger pension cost burden and lower initial employee contributions were more likely to enact such changes. And, among plans that made changes, those in states with the strongest legal protections for current workers were more likely to limit the cuts to new hires. Employees that won’t be retiring for decades. That will have almost no effect on the pension costs that are currently straining plans. One can try to cut off the pensions of corrupt officials, but that’s really not the problem. It’s a small amount. Yes, making sure corrupt aren’t running your assets into the ground is a good thing, but if you cut the pensions of officially convicted people, it barely makes a dent in the larger funds. Cutting some well-connected people from their pensions also barely moves the needle. Many other attempts to trim current pensions and other benefits have been struck down in court, though we’ve seen de facto pension cuts in many places. There will be further court action this year in places like California over this issue. Herbert Whitehouse was one of the first in the U.S. to suggest workers use a 401(k). His hope in 1981 was that the retirement-savings plan would supplement a company pension that guaranteed payouts for life. Thirty-five years later, the former Johnson & Johnson human-resources executive has misgivings about what he helped start. What Mr. Whitehouse and other proponents didn’t anticipate was that the tax-deferred savings tool would largely replace pensions as big employers looked for ways to cut expenses. Just 13% of all private-sector workers have a traditional pension, compared with 38% in 1979. “We weren’t social visionaries,” Mr. Whitehouse says. Many early backers of the 401(k) now say they have regrets about how their creation turned out despite its emergence as the dominant way most Americans save. Some say it wasn’t designed to be a primary retirement tool and acknowledge they used forecasts that were too optimistic to sell the plan in its early days. Others say the proliferation of 401(k) plans has exposed workers to big drops in the stock market and high fees from Wall Street money managers while making it easier for companies to shed guaranteed retiree payouts. Economist Teresa Ghilarducci, director of the Schwartz Center for Economic Policy Analysis, says she offered assurances at union board meetings and congressional hearings that employees would have enough to retire if they set aside just 3% of their paychecks in a 401(k). That assumed investments would rise by 7% a year. Two recessions in the 2000s erased those gains and prompted second thoughts from some early 401(k) champions. Markets have since recovered, but many savers are still behind where they need to be. Ms. Ghilarducci says she came to realize the 401(k) math she used in the 1980s and 1990s no longer works. The 7% annual compounded investing returns, a pillar of the concept, now seems too rosy. She now believes setting aside 3% of salary isn’t enough. So let me see if I get this right. Ms. Retirement Expert used to assume lower returns than public pensions assume, and said that lower contribution percentages than public plans were making would be sufficient? I have a feeling she’s lying about this. I didn’t get into the biz til 20 years after her, to be sure, but we were doing projections with 10% contributions (which I knew was too low) and assuming 6% returns to be conservative. But that’s a story for another time. Some initial believers in the 401(k) think those measures don’t go far enough. Ms. Ghilarducci wants to ditch the 401(k) altogether. She and Blackstone Group President Tony James are recommending a mandated, government-run savings system that would be administered by the Social Security Administration and managed by investment professionals. While both are Democrats, they believe their solution has bipartisan appeal. “There are a lot of governors and mayors who are Republicans, and the first wave of the crisis will affect states and cities,” Ms. Ghilarducci says. HA HA HA HA. It’s mainly the Democrat-run cities like Chicago and Detroit that had been under loads of stress. Big urban centers tend to be run by the Democrat-public union machines. They ain’t getting bailed out. Don Surber’s take is that liberals want to grab the 401(k) assets – and they obviously do. Just like they obviously want to grab IRA assets, and any assets at all. Money money money money! Teresa G. in particular has been pushing this private retirement asset grab for years, and I’ll dig that up another time. This is not a new revelation on her part, and it preceded the financial meltdown of 2008. I know, because I’ve seen her propose this stuff in person. 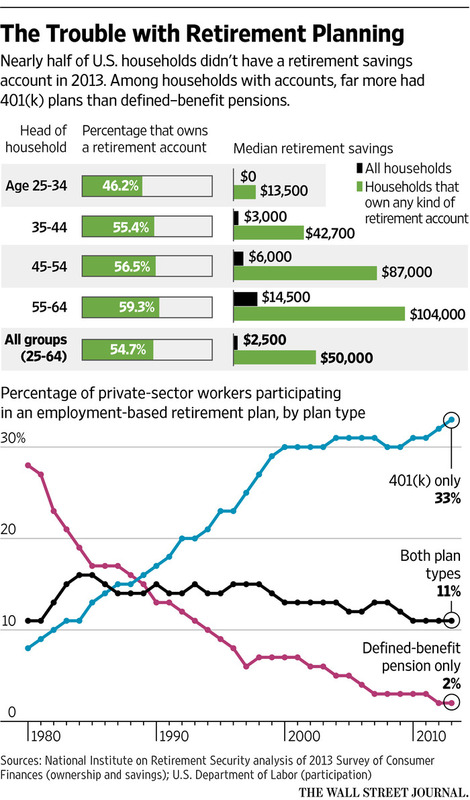 Note that it was never a majority of private sector workers having defined benefit plans. And here’s a key – why are people saving less of their disposable income for retirement? I doubt it has anything to do with DB v. DC per se. But that’s something I need to investigate. Mr. Whitehouse, the former Johnson & Johnson human-resources executive, says his 401(k) took a hit after 2008. He could retire if he had to, but if he wants to maintain his standard of living for several more decades, he must continue to work, he says. The 65-year-old currently lives in Orlando and is in-house counsel for ABC Fine Wine & Spirits, a Florida chain with about 140 stores. He plans to work into his mid-70s. It would be appealing, he says, to have an old-fashioned pension. “A pension is pretty valuable,” he says. You know what else were hit pretty bad in 2008? They didn’t have any magic that let them ride out the storm, you know. They also had a crappy 2015. But yes, a defined benefit promise is pretty valuable. It’s a very expensive promise. That’s why fixed income life annuities (aka immediate annuities) are so expensive. No, it’s not because eeeeevil insurance companies are trying to screw you over, but because a lifetime promise of payments is pretty damn valuable. Plenty of people live past “life expectancy”, and those going out to buy annuities tend to have better longevity than others (more on that tomorrow). The same things that make defined contribution plans underperform — asset values hit by bad economy, undercontributions during working years, income needed to be taken for longer and longer lives — also stress defined benefit plans. Public plans have been undercontributing to their funds for a variety of reasons (so have some private plans). These funds have had bad asset returns (and it’s killing pensions like Dallas Police & Fire). And longevity risk is really bad when you have a bunch of people retiring at age 55. Or younger. If you want to make the claim that everybody is screwed by the system, then you can’t make an argument for bailouts. Because you can’t have everybody being bailed out by themselves. You can have a few targeted groups bailed out, and that may happen. But California, Illinois, and even Texas can forget having the feds riding to their rescue. They’re too damn big to be bailed out. Bailing out banks was child’s play compared to the assets that need to be shoveled into the various promises. There aren’t enough new people and assets to grab. Everybody will have to lower their expectations – work longer, have less rich retirements, save more, pay higher taxes. And if you think that was a little on the depressing side, just wait til we get to tomorrow’s topic: death. But before I leave this post, I will note I will be dealing with specific pension issues as they come up in the news, but I also plan to do some deeper dives beyond my favorite targets of Chicago and Illinois, and see if I can build up some insights as to which pension benefit designs have been more sustainable (including the pattern of contributions). I don’t think defined benefit plans must necessarily be less sustainable than defined contribution plans, but one has to be willing to pay for the promises being made. Some of the insane behavior I mention above do make these plans unsustainable. Friday Foolery: More Centless in Seattle! And Cook County Regrets?